If you know how to play the game “Truth or Dare”, then you probably know how this feature will work: Each week I will provide a pair of “Truth” and “Dare” challenges for bloggers. Each week you may choose to do either the “Truth”, the “Dare” or BOTH! These challenges will be listed on this site plenty of weeks in advance to help participants plan their posts. Most options will be quick and easy – but still provide plenty of opportunity for great content! – and others will be a little more… daring. TRUTH: Usually will require you to answer a question or a prompt that can be completed in text format, such as a “discussion” or “list” post. DARE: These will require you to “go out of your shell” a bit. You may need to complete a special project, share photos, vlog or complete some equally “daring” task. Let your inner dare devil come alive! This week, I chose truth! I’m going to go all mushy on you for this one. As you can tell from my site name, I’m a mama to two little ones. I would so select my last book for them. 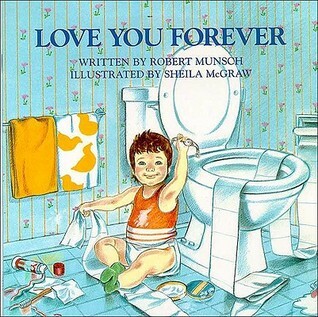 I would make a video recording of me reading Love You Forever. They will always be my babies no matter how old they get. I would want them to have a recording of me reading for them. For my son’s first Christmas, my grandparents got a recordable book of the first Christmas story for him. I cried so hard listening to it. It’s such a perfect memory. I would make sure there was another recording of me reading to them. If you had 24 hours left to live, what would you read?